We have discussed how Google makes money in 2007, now let us look at how Yahoo (YHOO) makes money in 2007. In 2005 Yahoo’s revenues were about $5.26 billion on which they had a gross profit of 3.16 billion and earned about $1.9 billion in net income. (Slightly higher than Google...) In 2006, Yahoo experienced revenues of $6.43 billion with a gross profit of 3.76 billion and a net income of $751 million dollars. Whoops what happened here? More revenue, a higher gross profit but less net income? (this represents approximately a 153% decrease in net income.) However it is still a nice income isn't it? So how does Yahoo make money? Yahoo offers a number of online properties and services to users; and various tools and marketing solutions to businesses. These products include such things as marketplace products that comprise Yahoo! Shopping, Kelkoo, and Yahoo! Auctions for shopping; Yahoo! Real Estate for real estate information; Yahoo! Travel, an online travel research and booking site and Yahoo! FareChase, a travel search engine; Yahoo! Autos to price and compare cars online; and Yahoo! Personals and Yahoo! Personals Premier for online dating. Yahoo which was founded in 1994 and is headquartered in Sunnyvale, California also makes money from their online advertising platform named Panama. It generates revenue by providing marketing services to businesses across the majority of its properties such as those listed above and by establishing paying relationships with users of its premium offerings. Yahoo offers a range of tools available for online display advertising, including media, and video. Advertising is also provided through a series of search offerings that enable advertisers to display text based links to their Websites on the Yahoo! Properties, as well as on its affiliates' Websites. Yahoo continues to generate revenue from other properties such as the Yahoo Directory which is one of the oldest directories on the Web. Companies can get their sites listed in the Yahoo Directory for an annual fee of $299. An entire summary of Yahoo products and services can be seen here. While Google's share price hovers around $525, Yahoo's share price currently floats around $27.50. In January 2000, Yahoo's share price hit a high of $118.75. Similar to Google, Yahoo's revenue stream is not solely from online advertising. However Yahoo does tend to have a more diverse revenue generating package that includes a number of products and avenues as mentioned above. On June 12th, 2007 Yahoo! 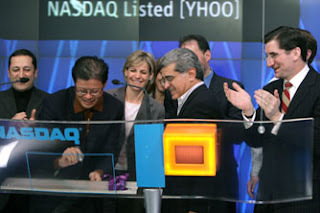 held their annual shareholders meeting where Yahoo CEO Terry Semel was questioned if he was focused on taking Yahoo to where they needed to be. He said that he was, but days later Semel stepped down and was replaced by Yahoo! co-founder Jerry Yang. Where is Yahoo going and what will revenues be like in the future? Only Yahoo! knows. With all of the recent restructuring at Yahoo! they may be looking to redefine what they are as a company so that they can continue to generate revenue and make money.